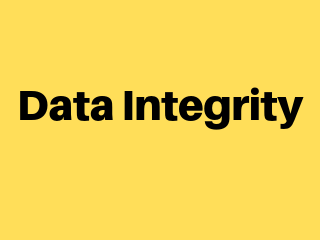 Data integrity refers to the validity of data, meaning data is consistent and correct. In the data warehousing field, we frequently hear the term, "Garbage In, Garbage Out." If there is no data integrity in the data warehouse, any resulting report and analysis will not be useful. The relationship between the primary key of one table and the foreign key of another table must always be maintained. For example, a primary key cannot be deleted if there is still a foreign key that refers to this primary key. Primary keys and the UNIQUE constraint are used to make sure every row in a table can be uniquely identified. For columns identified as NOT NULL, they may not have a NULL value. Only allowed values are permitted in the database. For example, if a column can only have positive integers, a value of '-1' cannot be allowed. For each step of the ETL process, data integrity checks should be put in place to ensure that source data is the same as the data in the destination. Most common checks include record counts or record sums. We need to ensure that data is not altered by any unauthorized means either during the ETL process or in the data warehouse. To do this, there needs to be safeguards against unauthorized access to data (including physical access to the servers), as well as logging of all data access history. Data integrity can only ensured if there is no unauthorized access to the data.